If you are seeking a getaway from your daily work routine, look no further than the Cook Islands: where pearl-white beaches and sparkling blue lagoons meet swaying palm trees and an island where no building is taller than a coconut tree. The Cook Islands are named after the European who discovered them, Captain James Cook, in 1773. By 1888 England had taken possession of the island and kept it for almost 80 years, until the Cook Islands joined with New Zealand into a separate government. Today the Cook Islands are a separate government that still associates and is technically under the sovereignty of New Zealand. Today the islands are immensely popular among spring-breakers, cruise takers, and beach bunnies for their dazzling lagoons and glimmering white beaches. Rarotonga is a volcanic island, towering 14,000 feet above the ocean floor. Surrounded by Muri Lagoon, Muri Beach is one of the best places for swimming and exploring. The beaches of Rarotonga are by far one of the biggest draws of the island. The lagoons of Rarotonga are perfect for almost every summer activity imaginable, including snorkeling, scuba diving, canoeing, and windsurfing. Whether you’re looking to stretch out on the warm sands or explore the sunken wrecks off the coast, Rarotonga can deliver it all. One of the most outstanding cultural experiences of the Cook Islands is Rarotonga’s Te Vara Nui Cultural Village. The Cultural Village gives visitors a glimpse into the lives of the local Maori people, who share their personal stories on tours of the village. Traditional dances are performed by talented dancers in the evenings during the open-fire dinner buffet on the stunning waterfall stage. The Over Water Night Show is a breathtaking display of music and dance set to firelight. Built in 1853, the Cook Islands Christian Church was originally associated with the London Missionary Society. 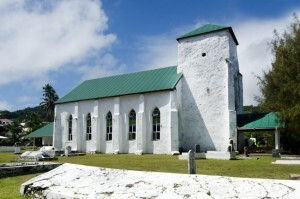 The Society set up their mission in the Cook Islands in 1821 and built the church three decades later. In 1968, the church became autonomous with the passing of the Cook Islands Christian Church Incorporation Act by Parliament. In 1978 a church was established in New Zealand for Cook Island residents who immigrated to New Zealand, resulting in 24 congregations in the Islands, 22 churches in New Zealand, and 15 in Australia. The serene white-washed exterior has housed famous figures, including author Robert Dean Frisbie and first prime minister of the Cook Islands Albert Henry. Some say paradise can never be found but anyone who agrees may not have been to Rarotonga. This is the jewel of the Cook Islands – a group which sprawl across the South Pacific covering an area akin to that of Western Europe. Offering white sand beaches, coral-filled lagoons, palm trees and a jungled island interior, journey to the Cook Islands is an authentic and refined Pacific experience encased in a lifestyle that exudes warmth. There are only 2 roads: a coast road and a ring road about 1650 feet further inland, so traffic won’t be an issue. Beware of the time though. Island time – or ‘Raro time’. It’s mesmerizing. Nestled between dramatic rainforest-clad mountains and Aroa Lagoon, a protected marine sanctuary on the island of Rarotonga. The Rarotongan is a distinctively Cook Islands resort, embracing all that is wonderful about this South Pacific paradise. Expansively laid out on six acres of tropical gardens fronting a long, pristine white-sand beach, The Rarotongan Beach Resort & Spa consists of 156 rooms and suites most of which are situated directly on or by the beach and one very special Honeymoon Bungalow. Take an idyllic island escape to the sunset shore of Aitutaki’s beautiful lagoon. With a glistening white-sand beach, swaying palms, bright blue skies and a clear turquoise lagoon, the Pacific Resort Aitutaki will take your breath away. © Copyright 2016 Travmarket. LLC.